I found this interesting article on Herald late Friday evening that claimed that there was such a place in Auckland that would make us think we had entered a different dynasty. 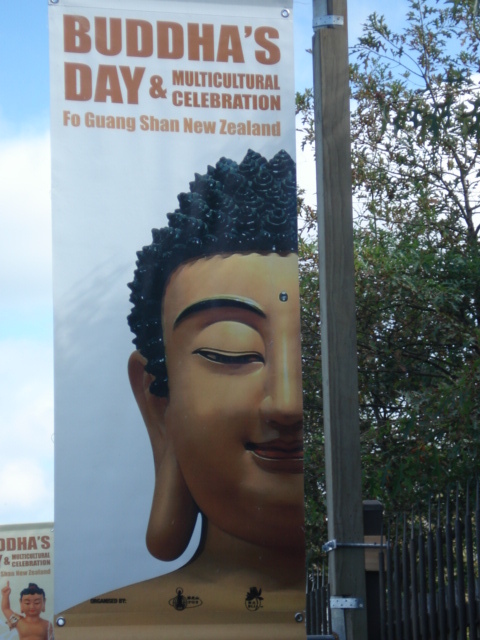 Finding it amusing I read the article further to find that it spoke of a Buddhist temple – Fo Guang Shan located in the Botany Downs suburb of Auckland. Ram and a couple of my friends decided to check it out today especially since the temple was hosting Buddha’s Day and a multicultural celebration. And I have got to agree with the author every bit and more. Whatever the author of the article described was true to its word but thousands times more vibrant and colorful than my imagination. Some of the scenes that are still green in my memory were the bamboo stalks lining the Zen Gardens, the cute little Buddha statues at every other part of the garden striking various poses, the stone lanterns, the Big Drum, the Iron Bell, Wishing bell and the stand out architecture in the middle of South Auckland. To give it an all gyrating mix which heightened our enjoyment of the first time visit was the traditional performances of various cultures. There were Japanese drums, Chinese Dragon dance, our very own Kiwi favourite -The Haka, Flamenco etc, Asian women and children decked out in traditional regalia and food stalls lining the gardens and paths with an all vegetarian fare to sate hungry tourists and devotees. As if that wasn’t enough there were stalls giving away Paper lanterns, Chinese zodiac stones, gift articles for a donation, which went towards the maintenance of the temple. The main part of the event of course should be mentioned, which would be the prayer offering to Buddha, with many people lighting colorful candles and incense sticks and placing it in front of the deity for their wishes to come true. Because it was a big event, there were many dignitaries present from different cultural backgrounds offering the prayers in their national language. Another notable new thing I came across was the special session for ‘Baby blessings’. As the name goes, it was exclusively for babies where in families brought them to get blessed so they would have a bright and prosperous future. After watching few of the events and prayers, out we came on to the food stalls, where they had organized a coupon system of prepaid food. And redeeming it for what ever we wanted. Very reasonably priced and a lavish array of items to choose from. We settled for Pad thai, Iced lemon tea and Sago dessert. Having experienced the Fo Guang Shan on one of its busiest days, I can’t wait to go there on a less crowded day. Most of the temple scape was dotted with throngs of people, which I am hoping will be less crowded on other days. I can literally imagine the peace and calm of those ornate walls and stone gardens beckoning me already. Here are some of the memorable images from our day out.